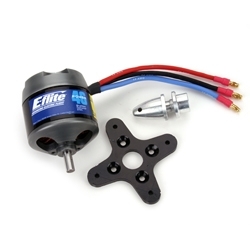 The Power 46 is designed to deliver clean and quiet power for .40 to 46-size sport and scale airplanes weighing 4 to 7 pounds (1.8–3.2 kg), 25- to 40-size 3D airplanes up to 5 pounds (2.2 kg), or models requiring up to 925 watts of power. It’s an especially good match for Hangar 9 .40-size trainers like the Alpha .40 (HAN2450), Arrow .40 (HAN2625) and warbirds like the T-34 Mentor 40 (HAN2425). Also a great match for sport planes like the Ultra Stick 40 (HAN1675 or HAN1690), Seagull Spacewalker 40 (SEA2050), and smaller sport 3D planes like the Twist 40 (HAN2650). Expect very strong performance with very short takeoff rolls and a great balance of thrust and top speed. Average duration is approximately 12 to 20 minutes depending on throttle management. Expect strong performance with very short takeoff rolls and a great balance of thrust and top speed. Average duration is approximately 8 to 15 minutes depending on throttle management. Expect good performance with a good balance of thrust and top speed. Average duration is approximately 5 to 7 minutes depending on throttle management.